Do you ever feel like time goes by so fast, and you never have a chance to get things done? You’re not alone. If you ask most people how they use their time, they’ll probably tell you that they have no idea. In fact, they’ll probably say something like “Time? What time?” because they don’t have enough time to get anything done! So, what’s the solution? Since we can’t add more hours to our days, the first step is to cut back on doing unnecessary tasks. How do we figure out what those unnecessary tasks are? 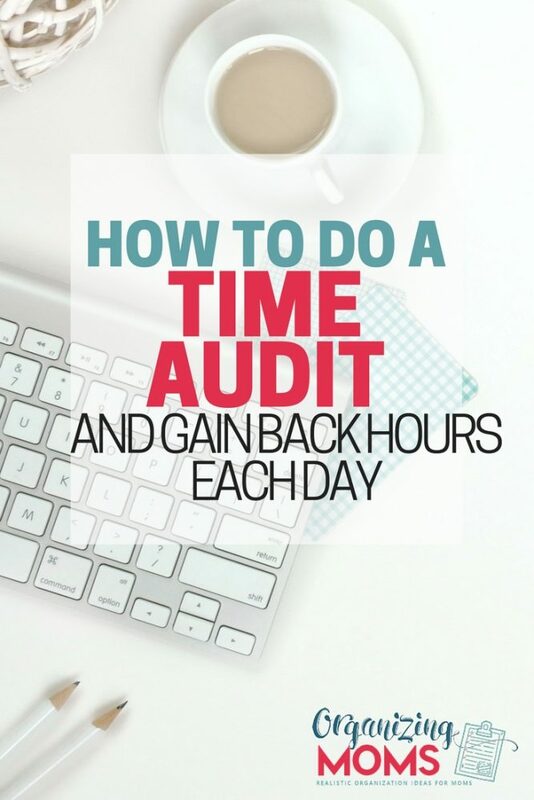 By doing a time audit. To do a time audit, you track your tasks over the course of several days to see how you typically spend your time. You record everything, so at the end you can sit down and really analyze what you’ve spent your time doing. How Long Should a Time Audit Last? If your days are pretty similar, a couple of days will probably do the trick and give you a good idea of what’s going on. If your schedule varies a lot from day to day, you might want to do a time audit for a whole week. This is especially helpful for parents who drive their kids to a lot of activities. Getting an idea of how much time you spend in the car is super helpful information! 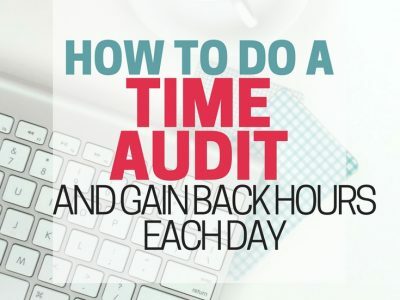 When Should You Do a Time Audit? Try to schedule your time audit for a typical week (or couple of days if you’re going that route). 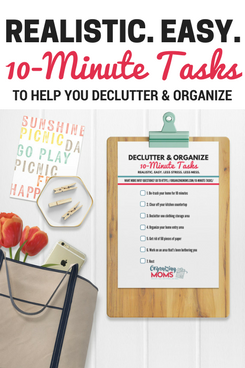 You don’t want to do a time audit during Spring Break, or during the last week of school when your kiddos have way more activities than usual. Strive to do your time audit during a “typical” time period. Of course, things will come up that won’t be typical, but just keep recording your activities. At the end of your time audit, you can make allowances for atypical things that came up. Use this resource from the University of Minnesota-Duluth. It’s a basic time use chart that has 30-minute increments. You can print it out, and use it for the week. It was made for students, but it would work for anyone who wants to track their time. Use Google Calendar. If you’re on your phone a lot, you can easily enter your activities into Google Calendar as you go about your day. This is the difficult (and annoying) part of the process. You’re going to have to set something up that will remind you to record how you’re using your time on a periodic basis. The easiest way to do this is to set an alarm for yourself on your phone. At first it won’t be a big deal, but after a few days, it will get old. But, if you want to get good information, it’s important to keep up with tracking your tasks. I’d start out by setting an alarm for each hour and recording that way. If that seems like too short of a time, make it longer. If you have trouble remembering, make your reminders closer together. If you KNOW you’re going to spend the next two hours at the movies, there’s no need to set alarms. Same with when you’re sleeping, doing a two hour commute, etc. Use common sense and do your best to keep up with tracking your time. Have you ever heard of Pearson’s Law? That’s going to happen while you’re tracking your time, and it’s kind of going to throw off your results. Your results will be better than they normally would be if someone was secretly watching you and tracking your time for you (which would be totally creepy!). Instead of doing yet another Facebook check-in, you’re probably going to go do something productive so you can record it! Just keep tracking. If you’re like most people, you have enough must-dos to fill your time anyway. By doing this time audit exercise, you’re just becoming aware some of the most cringe-worthy stuff. Once you have data about how you use your time, you can make changes. Maybe you’re spending way too much time watching Netflix, and you can cut back. Maybe you’re spending too much time doing laundry (who isn’t?) and you could figure out a way to share some o the work with the rest of your family. Once you have the information about how you spend your time, you can take action and make positive changes that will make your everyday days better.